New technologies for optimizing irrigation and increasing soil fertility in dry and semy-dry regions.The technology for reduction of irrigation water application rate (from 20 up to 30%) without negative influence on the crop production and quality was elaborated. The results obtained have demonstrated that the application of active Si increased soil water holding capacity by 10 to 30%,plant root system. Although Silicon (Si) is the second most abundant element both on the surface of the earth crust and in the soils, it has not yet been listed among the essential elements for higher plants partly because direct evidence is still lacking that Si is part of the molecule of an essential plant constituent or metabolite. However, the beneficial role Si plays in stimulating the growth and development of many plant species has been generally recognized. More recently, Epstein and Bloom (2003) have proposed a new definition of essentiality. Based on this new definition, the essentiality of Si for higher plants will be finally established. Over last two or three decades, the striking and unique role of Si in conferring plants against various abiotic and biotic stresses has received increasing interest. 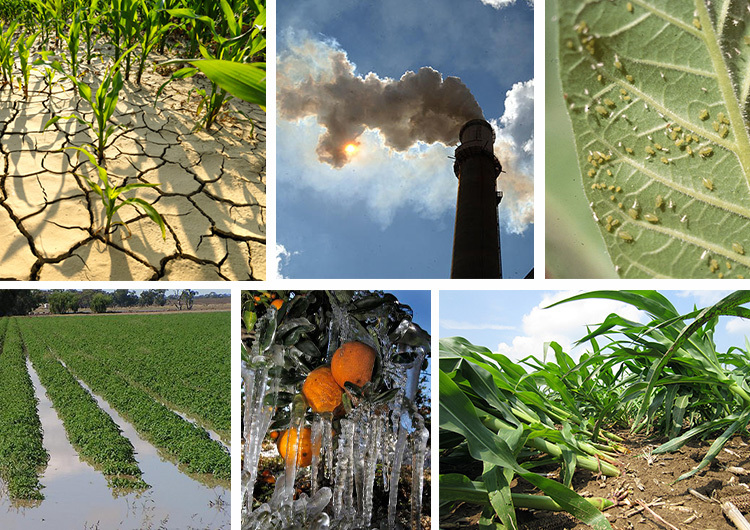 Silicon is known to effectively mitigate various abiotic (environmental) stresses including manganese, aluminium, and heavy metal toxicity, and salinity, drought, chilling or freezing stresses etc. However, mechanisms for such Si-mediated alleviation of various abiotic stresses remain poorly understood. This paper reviewed the current knowledge on beneficial effect of Si with focuses being on the possible mechanisms involved in Si-mediated alleviation of such abiotic stresses as manganese, aluminium, cadmium, and salinity toxicity. ““Silicon also alleviates many abiotic stresses including chemical stress (salt, metal toxicity, nutrient imbalance) and physical stress (lodging, drought, radiation, high tem-perature, freezing, UV) and others [1–4]. Most of these beneficial effects are also attributed to Si deposition in cell walls of roots, leaves, stems and hulls. For example, deposition of Si in the roots reduces apoplastic bypass flow and provides binding sites for metals, resulting in decreased uptake and translocation of toxic metals and salts from the roots to the shoots. Deposition of Si in the culms, leaves and hulls enhances the strength and rigidity of cell walls and decreases transpiration from the cuticle and, thus, increases the resistance to lodging, low and high temperature, radiation, UV and drought stresses. "“Silicon also alleviates many abiotic stresses including chemical stress (salt, metal toxicity, nutrient imbalance) and physical stress (lodging, drought, radiation, high tem-perature, freezing, UV) and others [1–4]. Most of these beneficial effects are also attributed to Si deposition in cell walls of roots, leaves, stems and hulls. For example, deposition of Si in the roots reduces apoplastic bypass flow and provides binding sites for metals, resulting in decreased uptake and translocation of toxic metals and salts from the roots to the shoots. Deposition of Si in the culms, leaves and hulls enhances the strength and rigidity of cell walls and decreases transpiration from the cuticle and, thus, increases the resistance to lodging, low and high temperature, radiation, UV and drought stresses. Before going further, Silicon uptake and beneficial effects have to be better understood." "The technology for reduction of irrigation water application rate (from 20 up to 30%) without negative influence on the crop production and quality was elaborated. The basic of suggested technology is using of active Si for optimization of soil properties (water holding capacity, chemical composition) and plant resistance to water or salt stresses. The results obtained have demonstrated that the application of active Si increased soil water holding capacity by 10 to 30%, plant root system. Water holding capacity, adsorption capacity, and texture of the soil were optimized by active Si via the direct effect of monosilicic and polysilicic acids. The preliminary analysis for prospective of Si fertilizer application was conducted for several countries of Middle East." "The technology for reduction of irrigation water application rate (by 20 to 30%) without negative influence on the crop production and quality was elaborated. The basic of suggested technology is using active Si for optimization of soil properties (water holding capacity, chemical composition) and plant resistance to water or salt stresses. The optimization of Si plant nutrition also increased the plant resistance to salt toxicity, which was demonstrated in the laboratory and greenhouse experiments. Using irrigation-drainage system designed by plastic relief mapping can protect the irrigated area against secondary salinity. The combination of elaborated methodology for design of irrigation systems with Si-based technologies can allow reduction of water irrigation rate from 30 to 60%."